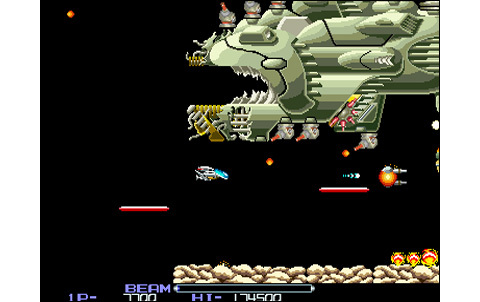 Here's the review of a title that was released in the late eighties, which just like Street Fighter II a few years later, has revolutionized the versus fighting genre to which he belonged, and for R-Type, we're speaking about the Shoot them Up genre. 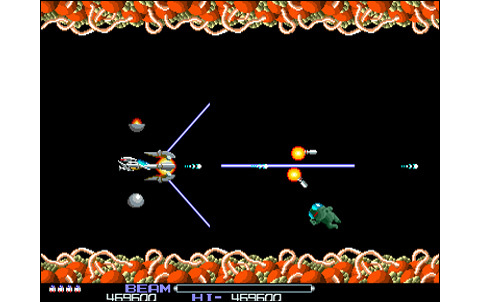 In the world of videogames and especially shooters, there's a "before" and an "after" R-Type, as this title introduced a brand new gameplay, featuring a complex weapon system and setting strategy at a new level, with the use of a defensive/offensive unit in addition to the ship. 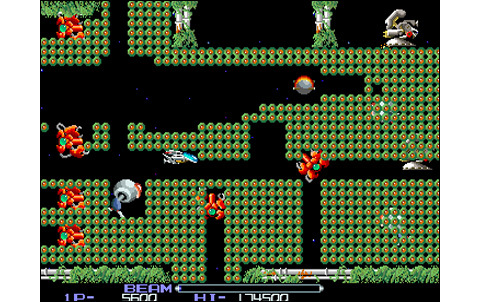 During many years after its release, dozens of titles were made that were shamelessly inspired by it, or that were simply a tribute to it (see Pulstar's review). So much that we no more can count how many of these were finally made. 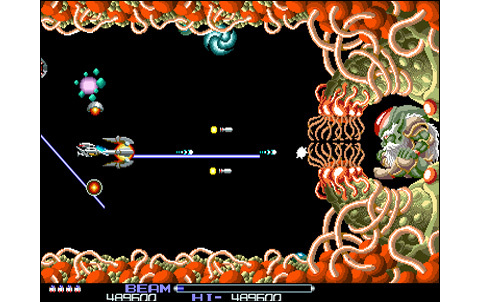 Also offering a revolutionary realization, the game of the small - but dynamic - japanese firm Irem will become a timeless classic in the arcades and will also be adapted on almost all home gaming systems (Super NES, Master System , Game Boy Micro, Coregrafx ...). 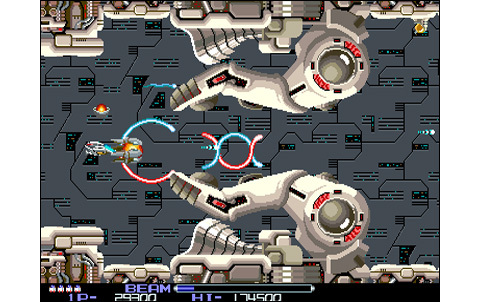 In fact, a brand new way of playing in Shoot them Up was born, since R-Type was the first game to integrate an indestructible shooting pod that can fit the ship, and be arranged all around it. 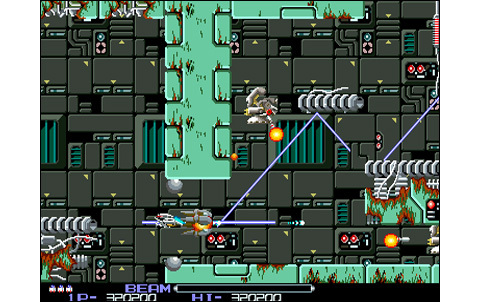 One can even say that the whole game strategy is based on it, as this one also serves as a shield that stops enemy fire. And let's say that it's obviously its primary fonction, as it might save your life hundred times during the action, provided you mastered its use by positioning it correctly around your ship. The module can be placed at the front or at the rear of the ship,. You can also fill the power meter at the bottom of the screen by depressing the fire button: this allows you to deliver more powerful shots. 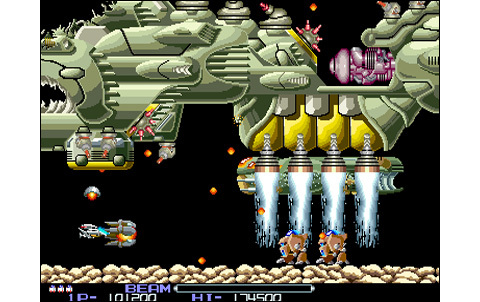 Besides this large module, up to two additional shooting satellites can be attached to the ship, as well as a pretty large arsenal (lasers, missiles, bombs, homing, etc). In short, this is very comprehensive and we won't complain! Anyway, R-Type is still very difficult despite this impressive stuff you can use, as the ship is destroyed at the slightest impact. 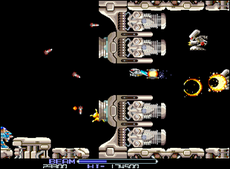 This causes the loss of all bonuses collected, weapons and speed, but also have you to restarting from the beginning of the level or from a determined checkpoint. That's not easy, because some passages have to be learned by heart for you to cross it one day. 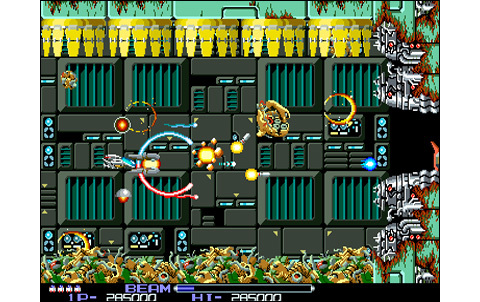 The controls are almost perfect, even if the power up and speed up are sometimes necessary to escape your attackers during some tough battles. 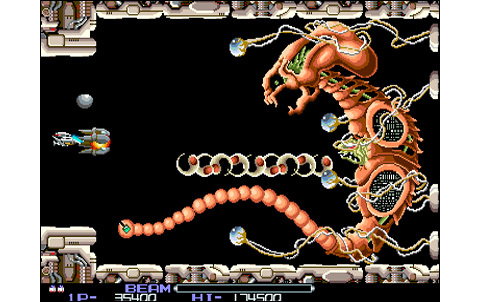 Enemy sprites are much varied for the time, as each of the eight stages of the game features its own bestiary, apart from some recurring creatures. The bosses are among the most impressive of the games of this generation, with some of them that are for sure still present in the memories of players. The realization R-Type is top-notch, especially regarding which year the game came out. 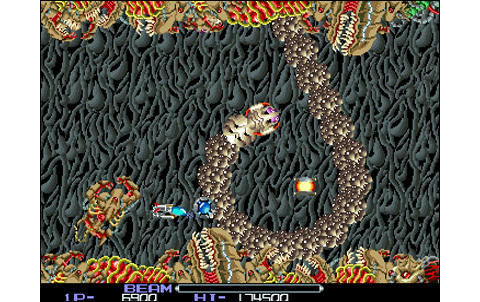 The graphics are fine and colorful, stages are all very different and the backgrounds are original and surprising. Players can't help but want to see the next stages! For sure, one might notice nowadays that some backgrounds are a bit empty, but nobody ever told about this back then. 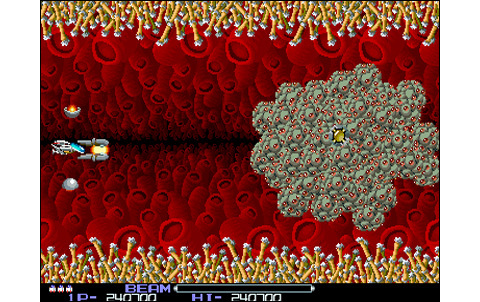 Especially since everything else was extremely successful, like lasers, enemies, explosions and of course the spectacular Bosses. The animation is simple and fast, and the pretty rare slowdowns they don't alterate at all the gameplay. Only the audio part is a little more average, with simple catchy themes, and FX just like in the other games of the time. 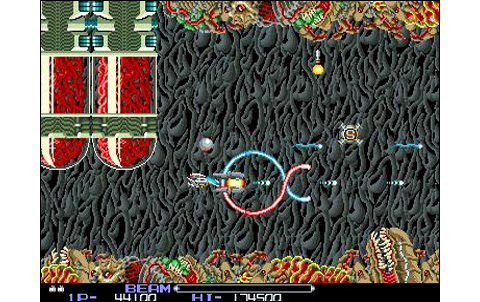 The weapon system, the realization, the difficulty, the pleasure of clearing levels and discover the next ones... That's all assets and pleasures that R-Type have to offer after more than twenty years. 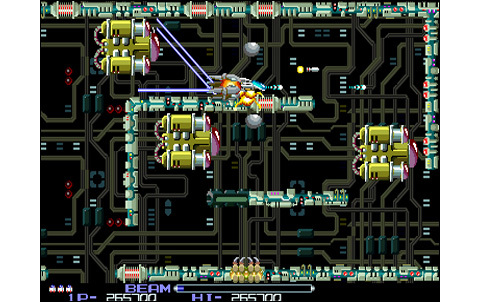 A timeless hit as there are few, with such a fabulous gameplay, still perfect, even after many generations of gaming systems have passed. 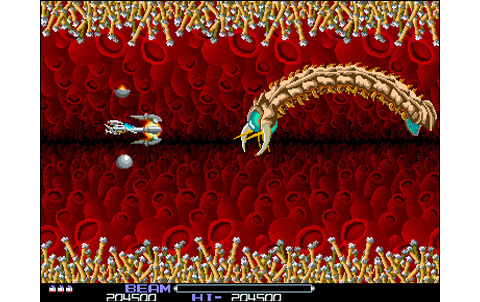 Backgrounds and enemy sprites are varied, game design is successfull and Bosses are downright fabulous. Cream of the crop, back in 1987. Slowdowns are very rare, game speed fits perfectly and everything moves smooth. We're granted simple and catchy themes, decently using the system's capabilities. Sound effects are doing Par, no more, no less. Eight hard stages awaits you for a great challenge. 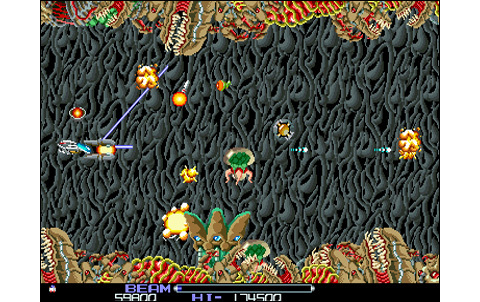 Hours and hours of practice are required to clear this incredible game. 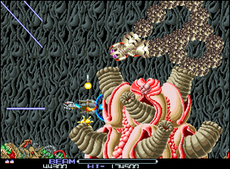 Bringing new standards in the world of Shoot them Up, R-Type is a timeless reference in terms of gameplay. 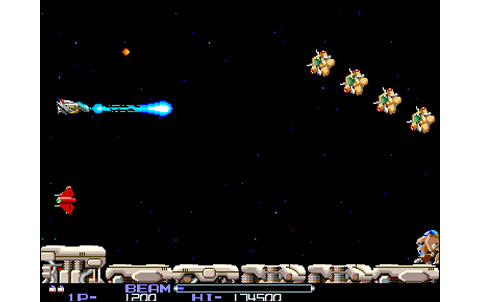 Any player worth of the name can't talk about Shoot them Up without thinking about R-Type! 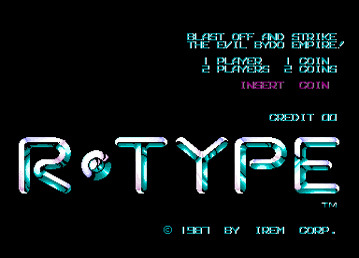 A timeless classic, which gameplay is still actual. 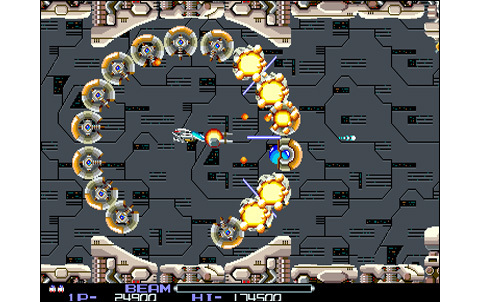 Last Resort, released in 1992, uses a similar pod system and stands as an excellent choice for R-Type lovers. 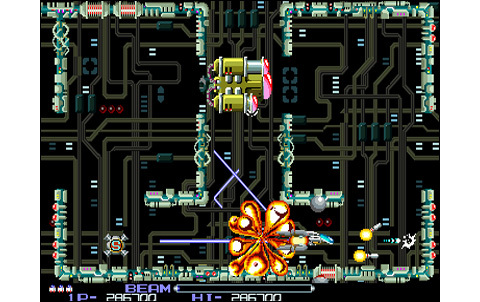 Anyway, the ultimate reference here is Pulstar, which is -like said before in the review- the ancient Irem's programmers tribute to this intemporal game.